These words radiate light to us when we need it most in our nation's journey towards integrity and peace. It is a call to authentic and effective Christian witness amidst great difficulties and contradictions. In 19 April 2009, in preparation for the May 2010 elections, the CBCP declared a Year of Two Hearts for Peace-Building and Lay Participation in Social Change. The document noted that "the participation of the laity in moral leadership pertaining to every specific discipline and institution in the Philippine society is most essential, if we want the Gospel and the social teachings of the Church to have a tangible and positive impact at all on our life as a nation." Recognizing the competence of the laity in transforming society, it goes on to challenge them "to take the lead in the task of moral renewal towards a deeper and more lasting change in the Philippine society." Among other things, it called on "all lay people involved in politics to renounce corruption and bond together in the task of evangelizing politics for effective governance and the pursuit of the common good…"
One such concrete expression of Christian discipleship is the witness of the truth-teller in cases involving the use of public office for private gain. It is not easy to be a truth-teller considering the tremendous sacrifice this entails for individuals and their families. This is not for the fainthearted. Most prefer to just keep quiet. The on-going plunder case against Gen. Carlos Garcia, former military comptroller is a case in point. We laud former COA auditor Heidi Mendoza, former Ombudsman Simeon Marcelo, former special prosecutor Dennis Villa-Ignacio, and more recently Lt. Col. Rabusa who heeded this call. They have also exposed the desperate moves of government and financial institutions that try to cover up the crimes. Please heed the call of noble Filipinos, like Heidi Mendoza, when they come out against the abuse of office that impoverishes the people and harm the common good. It is unfortunate that the greatest threat to our country's well-being has come not so much from globalization or financial crises but from the entrenched system of corruption that has crippled our development and eroded public trust. But it would be even worse if truth-tellers themselves, who struggle to live a life of integrity, would be left in the cold, while the real culprits were allowed to enjoy impunity. This is an opportunity for us to get our acts together inspired by these men and women who are stepping up for their faith! Paring Bert was asked by Former Ombudsman Simeon Marcelo and Former Special Prosecutor Dennis Villa Ignacio to organize a special mass for truth tellers. Bishop Pabillo agreed to officiate at mass, held on March 2, 6pm, at the Church of the Gesu in Ateneo de Maniila University campus. It was graced by the presence of Heidi Mendoza, champion of truth telling about the corruption in the mmilitary and member of the Ehem Board. Col George Rabusa also came, and together with Heidi lighted the candle that started the whole big congregation holding and waving light. We hope that our Ehem friends will be more empowered now by the great and noble example of Heidi Mendoza, who has been featured in the Ehem videoducmentary since 2006, and mendtioned in the song Ehemplo that can be dowloaded in the you-tube. Mabuhay to our Ehemplos --- truth tellers and truth sharers! "The disciples were on the road, going to Jerusalem; Jesus was walking on ahead of them; they were in a daze, and those who followed were apprehensive." These words of the Gospel can very well picture our situation. We are walking in a daze. We are apprehensive. We are going up to Jerusalem. Jerusalem was the lair of those who opposed the Lord. Jerusalem was the place of persecution. We too, those who tell the truth and those who walk with them, now find ourselves in the lairs of the powers that be – the senate, congress, supreme court, the AFP. We are not even sure who our friends are. We are not sure of the motives of those who side with us. Will they always be on our side? What we take comfort in is that we are following the Lord. He is walking ahead of us. He is our rock and our fortress. We can completely trust him. We are reminded of what he told his apostles at the Last Supper: "In the world you'll have troubles, but be brave, I have overcome the world." This is the reason of our gathering this evening. We gather to comfort ourselves with the Lord's presence in the Eucharist. We strengthen ourselves in this journey. This indeed is a journey and we do not know how long it will last and where it will lead. In this journey we allow ourselves to be purified by the Lord. He purified James and John, the sons of Zebedee, and also his ten other apostles. They had been following the Lord for three years and still, already towards the end of the journey, they were seeking themselves, dreaming of positions, of having their names put forward. Till the end the Lord Jesus had to remind them that true greatness is achieved in service, that life is brought about by dying. Oh, how we too need this message! It seems many times that all this sacrifice of exposing the truth, all these efforts of serving the country are coming to naught. People, especially those in government who are supposed to be happy that the truth is coming out, are the very ones who belittle the effort, and even deny them and disprove them. Even those who claim to fight corruption are very soft-spoken in encouraging the truth tellers and very timid in calling other people to speak out! We really need the assurance of our faith that we are in the right path in spite of what politicians say and do. In turn I call on our leaders who aim to fight corruption to take advantage of the situation now that people are being called to account for their deeds. This is a serendipitous moment in our country that several are speaking out. We all had been looking for a big fish in the fight against corruption. Even without the intended Truth Commission some big fishes are now hooked. Let the support to them not be timid and tepid. The same too in what is happening in the Lower House of Congress. Let the support be loud and clear for the impeachment process to progress. We call on the members of congress not to play politics but to pursue the investigation of the truth in the impeachment process. Let the light of truth shine out! Let our prayer be the prayer we heard from Ben Sirach in our first reading: "Have mercy on us, Master, Lord of all and look on us. Cast the fear of yourself over every nation. Let them acknowledge you, as we have acknowledged that there is no God but you, Lord." This is what we ask, the fear of the Lord, ang takot sa Diyos! Dahil sa takot ng Diyos, nagsalita ang ating mga kapatid na ito. At the beginning some of them might have come out due to reasons that may not be so noble. But little by little the fear of the Lord sinks in and it becomes a major motivation in these difficult decisions. If we look at it from purely human considerations, mas madaling manahimik. Ngayong nagsalita na sila, nagulo na ang mundo nila. Huwag sana nating hayaan na mabali-wala ito. So we too are here because of the same fear of the Lord. Naninindigan din tayo, at nagtataya, sa pagsuporta sa mabuting gawaing ito. Mahalaga na ang ginagawa ng ating mga kapatid sa pagsasalita ng totoo. Pero hindi nila ito kayang mag-isa. Kaya mahalaga din ang ating papel na ipakita at iparamdam sa kanila, sa mga kinauukulan at buong bansa, na may naninindigan din para sa mga naninindigan! So we continue the prayer: "Lord, cast the fear of you over every nation, over our entire nation." May this act of trust and truthfulness inspire still many others to come up and speak up. Mas maging madali na lumabas ang katotohanan kung ang lahat na may alam ay magsalita. One lighted candle is weak but when all light their candles this big hall will be well lit. We continue to pray that the fear of the Lord may overtake their fears. Ito rin ang panawagan sa buong bayan. Mas marami sanang lumabas at sumuporta sa mga nagsasalita ng totoo. If people see that there is a groundswell among Filipinos to support the truth tellers, this may embolden still more to speak up; and no corrupt person, no matter how powerful, can hide behind the veil of dissimulations and even threats. We all have to break through the barrier of fear. The phrase "Barrier of Fear" is much used nowadays referring to the People Power happening in the Arab world. For so long they have been abused and oppressed by suppressive regimes and leaders until they all as a people went out and cross the barrier of fear. Changes, un-dreamed of changes, are happening now before our TV sets because many unknown ordinary people together stand up and cross the barrier of fear. Let this happened too in our country. It did happen 25 years ago in EDSA. Can the spirit of what we did then still live on today? We need this now to fight corruption – to cross the barrier of fear by speaking out the truth and by supporting those who speak the truth. Let the fear of the Lord move us to cross the barrier of fear to face the truth. If you ask our truth tellers here – ask Jun Lozada, ask Heidi, ask Col Rabusa, ask Villa-ignacio and Marcelo, and still so many others, what moves them to continue to expose the truth and not be silenced by enticements and threats, many will admit that they get strength from the support of many, even unknown people, who in their own small ways believe in them, such as handing them their hard-earned 20 pesos, giving them a free meal, or just simple tapping their back to say, naniniwala kami sa iyo, ipagpatuloy mo. Mga kababayan ko at kapwa Kristiyano. Laban po natin itong lahat! Hindi lang ito laban ni Heidi Mendoza, ni Atty. Marcelo, ni Col Rabusa, ni Villa-ignacio, ni Col Lim at ng sinupamang magsasalita. Laban po natin itong lahat, sapagkat ang pera pong pinaglaruan ay hindi lang pera ng AFP ngunit pera ng Pilipinas. Ating lahat ang diwang nadungisan ng katiwalian at ang diwang matutubos ng katotohanan. Iyan ay ang diwang Pilipino! Let everyone know, as we know that there is no God but you of Lord, and in our Filipino hearts – lumatay nawa lagi ang takot sa Diyos! The Church has been very much a part of the collective soul-searching in the aftermath of the multiple eruptions of corruption and consequent protests and uprisings that have left a swath of destruction of persons, property, morals and hope for the future while simultaneously leaving our country under a heavy load of debt that could have been paid off by the funds plundered. As a consequence The Society of Jesus in the Philippines convened the Committee on the Evangelization of Culture. Reaffirming the Society's commitment to "the service of faith that promotes justice and transforms culture," the Committee was mandated with exploring ways by which significant interventions can be made in transforming not only the sociopolitical and economic, but also the cultural dimension of people's lives. In the course of its work, the Committee chose to focus on the issue of corruption, a social malady that is both a cause and symptom of decadence in Filipino culture. When an evil has become part of the fabric of social life, there is a tendency simply to accept it, no longer to feel any moral revulsion or protest against it. That corruption has, sadly, become so ordinary a part of the Filipino way of life on all levels is one of the reasons it is so difficult to eradicate. Laws and policies will be ineffective unless the culture which practices and tolerates corruption is transformed. Ehem! 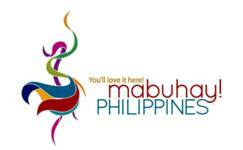 began in 2002 as an anti-corruption initiative of the Philippine Province of the Society of Jesus. Ehem! at the beginning, was basically a two or three day seminar, the modules of which were based upon a manual. Each seminar aimed at bringing participants to a renewed sensitivity to the evil of corruption and its prevalence in ordinary life. It seeks ultimately to make each participant aware of his or her own vulnerability to corruption, his or her own uncritiqued, often unwitting practice of corruption in daily life. It hopes to bring people, in the end, to a commitment to live a new way: critical of corruption, intent on integrity. Scores of seminars were conducted across the nation during the remainder of the first decade of the new 21st Century. And from the many diverse groups that have undergone Ehem! --- student groups, seminarians and religious, Church organizations, business, academic and professional groups, government agencies, NGO's --- Ehem! has grown from a seminar into a movement of men and women who have a new consciousness and a new resolve, no longer resigned to the dominance of the corruption that destroys trust and exercerbates poverty; the seeds of a new culture of integrity and honesty in private and public life. We thank all those who have conceptualized, implemented, and enriched the Ehem! program through the years. And we pray for the continued growth and development of the program: through Ehem! may the Gospel and its values truly transform Philippine culture so that God's gracious Kingdom might become more of a reality in the lives of our people. AS THE NATION heaps praise and admiration upon former government auditor turned whistle-blower Heidi Mendoza, I am reminded of two words: "common virtue." This was the title of the last chapter of John Bradley Jr.'s 2000 bestseller, "Flags of Our Fathers." The book is Bradley's account of the lives of the six American soldiers who raised the flag atop Mt. Suribachi on the Pacific island of Iwo Jima, site of one of the most horrendous battles of World War II. The photo of the flag-raising soon became one of the iconic images of the war. The three flag-raisers who survived the battle (one of whom was Bradley's father, John Sr.) were brought home and hailed as heroes, a role they reluctantly took on to help sell bonds to fund the war effort. Bradley's final description of the six men could very well apply to Heidi Mendoza, former AFP budget officer George Rabusa, and other men and women who have risked their personal well-being in pursuit of the truth. Here I paraphrase Bradley's words freely: "They are people of common virtue. Called to duty. Sisters and brothers. Sons and daughters. Mothers and fathers. It's as simple as that." I have known Heidi Mendoza for many years through her husband Dr. Roy Mendoza, a good friend and former colleague at the John J. Carroll Institute on Church and Social Issues (JJCICSI). When I texted Roy to congratulate him for Heidi's highly acclaimed testimony detailing evidence in the Garcia plunder case, I received this short but meaningful reply: "Everything we are now, we owe to our faith." The statement, I feel, reflects all that is good and right not just in the singular act or courage that Heidi displayed with her testimony, but in the total commitment Heidi and Roy have displayed all through their lives. Theirs is a "faith response" in the truest sense, quiet lives of service nurtured by faith and lived far from the limelight, until now. At the onset, Heidi and Roy seemed like an unlikely pair. Heidi followed a fairly unremarkable path, working at the Commission on Audit soon after graduating from college, the start of more than 20 years of service in government. Roy on the other hand took a more roundabout route, going full-time into student activism before resuming his education. He married Heidi just as he began a career in community organizing and research for a series of Jesuit institutions: the Center for Community Services, the La Ignaciana Apostolic Center and JJCICSI. When Roy decided to settle down to teach history at the Ateneo de Manila University (eventually obtaining a PhD in history from the University of the Philippines), it was Heidi's turn to enter into direct involvement in justice concerns. Because of her long years of experience in the COA, she became affiliated with the "Ehem!" anti-corruption initiative of the Philippine Jesuits, working closely with Fr. Albert Alejo, SJ, on various anti-corruption and education campaigns. It was through her involvement in "Ehem!" that she mustered the resolve to reveal the anomalies in the COA investigation of the Garcia case. In a recent meeting with Heidi and Roy, they shared with me their reflections on the twists and turns that their lives have taken. Roy lightheartedly recounted: "When we were deciding whether Heidi would come out in the open with her knowledge of the Garcia case, she reminded me that when I was younger she tolerated my work in political activism. She told me that it is her turn now to be the political activist. I had to remind her, in turn, that when we were younger we did not yet have any children." Indeed, thoughts of her three children have not been far from Heidi's mind in the midst of the political maelstrom she has entered. During a strategizing session at the Ateneo School of Government several weeks before her testimony in Congress, Heidi explained her anguished decision to go public in these words: "I am not doing this for myself, to seek publicity. No mother in her right mind will endanger her children just to get publicity. I am doing this to prove to people that not everyone in government is corrupt, that there are good people in government." Her disavowal of personal fame and her abiding concern for family and country have become a constant refrain in Heidi's public appearances. And with each retelling, I become more convinced that she would rather cast herself as an ordinary person doing the right thing. Hers was a decision emanating from a conflicted conscience seeking peace, no matter what the cost. Just like Bradley's flag-raisers, Heidi is a reluctant hero. "A person of common virtue . . . it's as simple as that." In their show of support for Heidi, the Philippine Catholic bishops quoted from their own pastoral letter two years ago encouraging lay participation in social change: "We challenge our Catholic laity, in particular, to take the lead in the task of moral renewal towards a deeper and more lasting change in the Philippine society. We challenge all lay people involved in politics to renounce corruption and bond together in the task of evangelizing politics for effective governance and the pursuit of the common good." Perhaps the bishops realized that there are enough good people out there who simply need to be encouraged, people of "common virtue" who can truly make a difference. But as Heidi Mendoza has shown us, perhaps common virtue is not so common. Indonesia is the second most corrupt country in Asia after Cambodia. Association for the education of young Catholic leaders organized a meeting in Jakarta with Indonesian and foreign officials and experts. Filipino activist: "the fight against corruption starts in reviewing are own lifestyle”. Jakarta (AsiaNews) - Fighting corruption with the Christian education of youth and the spread of values and ethics in the workplace. This is what emerges from the encounter with some church leaders, ngo activist, lecturers, media editors, anti-corruption watchdog and business leaders organized April 2 last in Jakarta by the Bhumiksara Foundation, a Catholic association that has promoted the formation of young Catholic leaders. 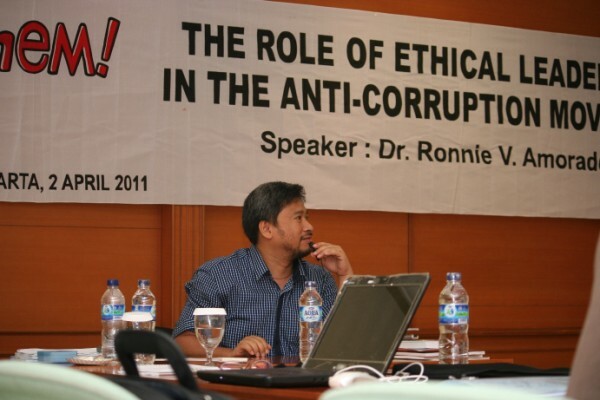 Leading the conference Ronald V. Amorado (pictured), a Filipino activist and coordinator of Ehem, an organization for fighting corruption in the Philippines founded in 1988 by Jesuit priest Father Albert Alejo. "Corruption - Amorado said - is a contagious virus in our society. This practice has nothing to do with religion or with economic prosperity, however, it depends on personal ethics and values”. According to a survey by the Political and Economic Risk Consultancy (PERC) a Hong Kong based consulting firm specializing in the study of corruption in Asian countries, Indonesia is the second most corrupt country in Asia after Cambodia. In his experience in the Philippines, Morado understood that all areas are at risk from corruption, including religions. "We Catholics – he said - in order to be professional and respected in the economic field, must follow and promote a spirit of anti-corruption among our colleagues and friends, and it is good to start this journey judging our own ways of living." J.W. Junardy, a businessman and representative for Indonesia at the UN Global Compact Network Association, said that the Church and the Catholic world must be an example to follow for the people. According Junardy, the fight against corruption is a risky topic and to be effective everyone must follow their own ethical path. Otherwise, the risk is the manipulation of the fight against corruption. An example is the radical Islamic parties, which exploit the issue to gather support, proposing the application of sharia as the only antidote. Corruption is a major problem in Asia and in countries like Indonesia, Cambodia, China, Vietnam and the Philippines is not only widespread in the public sector and large companies, but also on a local level and costs States billions of euro. The governments of these countries each year announce new commissions to combat the problem, but these in turn are transformed into devices to allow a political party to pursue their own interests. Ehem has become a rallying guttural voice and a creative battlecry for people who want to combat corruption in the Philippines. It is an anticorruption cultural campaign that aims at making people more seriously sensitive and bothered by corruption, and be more deeply involved in combating it. >>> Ehem is a voice to grumble, to confront, and to resist corruption. (Ang Ehem ay pagdabog, pagkibo at pagtutol sa pandaraya at katiwalian!). >>> Ehem is a gentle but powerful sound to caution and make one’s presence known, which brings forth some sense of embarrassment among those who will commit corruption (Ehem! Nandito ako, may masama ka yatang binabalak!). >>> Ehem is a nondidactic but confrontational signal that calls the attention of people, especially those who have the propensity to commit corruption. (Ehem! Anong ginawaga mo! Anong ginagawanatin!). >>> Ehem is a guttural pitch that deters or discourages the commission of corruption. (Ehem! Itutuloy mo pa ba? Itigil na natin ito, ang sama talaga eh!). >>> Ehem is a subtle but effective signal that reminds people to be vigilant and mindful of one another’s roles and actions to counteract corruption. (Ehem! Magbantay kayo! Masisikmura ba ninyong wala kayong ginagawa!). >>> Ehem is a very compact word that evokes people’s intolerance and warns of people’s rage and against corruption (Ehem! Bistado na kayo! Galit na ang taong bayan!). Ehem is a tool for making people more seriously sensitive and bothered about corruption and more deeply involved in combating it at the individual, group and institutional levels. 1. Facilitate a process among the various sectors towards understanding the culture of corruption, its various standpoints, and the roles of individuals and institutions in the perpetuation of corruption in Philippine society. 2. Provide an avenue for analyzing issues and situations of corruption, and their immediate and long-term causes and consequences. 3. Allow serious reflection among different sectors to generate insights on their value systems that reinforce or prevent corruption. 4. Build commitment and formulate integrity plans to combat corruption. Many have been asking: what is the anticorruption strategy of Ehem? What makes it different from the other anticorruption initiatives? surprised to learn how the “love funds” or “Saturday collection” of the BECs (Basic Ecclesial Communities) are being spent by their officers for personal use. assess to what extent we have contributed to the problem. of Ehem is found in the process of PAGTETEKA or TEKA MUNA (stop, wait, think and reflect!). It makes people more sensitive to their attitudes and actions that might have been cooped up in anomalies. It awakens people to their vulnerability. It also provides the opportunity to come up with alternatives or recommendations to keep away from these vulnerabilities. wrote in his preface to the third edition of the Ehem manual: “It seeks ultimately to make each participant aware of his or her own vulnerability to corruption, his or her uncritiqued, often unwitting practice of corruption in daily life. It hopes to bring people, in the end, to a commitment to live a life in a new way: critical of corruption, intent on integrity! Fr. Albert Alejo, S.J., EHEM Anti-Corruption Movement initiator and moving spirit, came up with a Lenten reflection that aims at fighting corruption within the Church. His advocacy is anything but unimportant, for we who read the Word of God must "believe what we read; preach what we believe, and practice what we preach." Since its inception, several government agencies and private sector organizations have adopted and implemented the Ehem anticorruption program. In 2003, the Office of the Ombudsman declared Ehem as its flagship graft prevention program and entered into a formal partnership with the Jesuits and created the Ehem! Aha! Technical Working Group (TWG). The TWG advocates and implements the Ehem program in national government organizations and local government units among others. 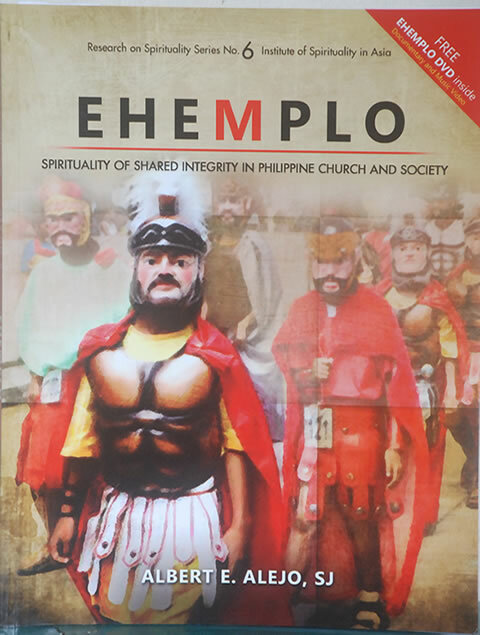 The Catholic Bishops’ Conference of the Philippines (CBCP) also came out with a Pastoral Letter in 2003 exhorted the implementation of the Ehem program in various parishes and pastoral programs nationwide. Since then, more than a hundred Ehem seminars and auxiliary programs have been conducted in the Philippines, covering the major cities and regional centers. In 2006 also, Ehem was granted by the Philippine government its patented trademark as an anticorruption program with all its concepts, principles and collateral advocacy materials. Ehem thus offers both opportunity and challenge for those in the forefront in anticorruption work in exerting greater efforts towards establishing a just and human society.